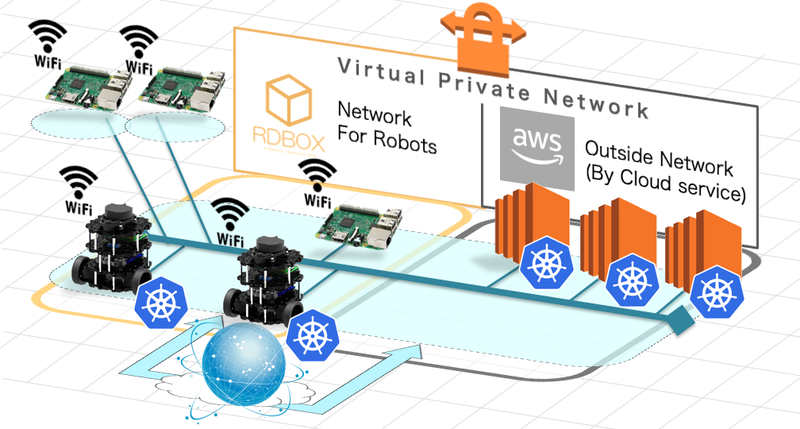 Auto-build Kubernetes cluster & Secure-Scalable Physical-network optimized for ROS robots. Export IT technologies to the robotics community. Robot engineers are considered the best and the brightest, and they can certainly multi-task. However, there are too many other (complicated and stressful) things that prevent them from concentrating on development. We, wanted to help those best and brightest engineers concentrate more on robot development and so we designed "RDBOX," a partner to robot engineers in the IT field. Easily set up a dedicated local area network for robots. Security requirements such as VPN (SoftEther-VPN) and NAT / firewall recommended by ROS-Wiki (http://wiki.ros.org/Security) have been applied. It can be used simply by connecting to the Wi-Fi or wired LAN network provided by RaspberryPi3 installed with RDBOX edge node that acts as an access point. 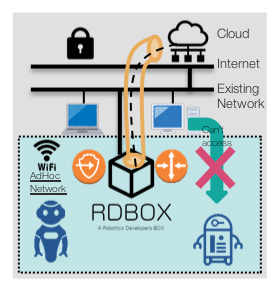 Simply connect RDBOX in between the internet and your service robot. In one simple step, you can build a local area network and development environment. No knowledge of internet or networking is necessary. Unlike other ROS robot platforms, the existing ROS robot debugging tools can be used as they are. Please continue to use debugging with rviz, rostopic command, rqt command, etc. In addition, Kubernetes enables advanced automatic delivery and operation functions such as rolling updates and rollbacks. Treating robots as server clusters, our platform is suitable for "Swarm robots (SR)" control in the order of tens to hundreds. It has become possible to easily challenge development that was difficult until now. Take advantage of virtualization to reduce stress. RDBOX makes it easy to build Kubernetes clusters that can mix CPU architectures. Robots are often equipped with ARM architecture CPUs in terms of power efficiency. RDBOX is not aware of the mixture with the common x86 architecture in cloud computing. No matter how many robots there are, you can control from one place. (Kubernetes Dashboard and command of kubectl.) Configure the Kubernetes cluster with all the computer resources on which the robot app runs. Start and monitor nodes and processes, and standard output from them can be handled centrally from the RDBOX. 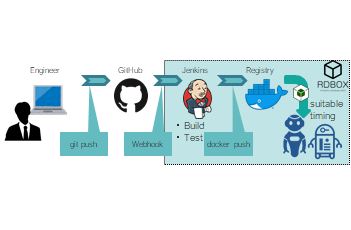 Container virtualization frees engineers from repeated setup of the OS and middleware. Save "Docker container image" with OS and middleware already set up in the registry. At the time of robot application development, by implementing only difference based on this container image, repetitive work is suppressed. Continuous development and management of robots through CI. 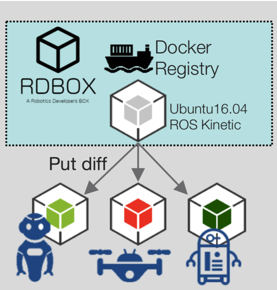 RDBOX supports CI tool implementation. Less pressure on engineers in deployment to production environment. CI tools that are commonly used in the field of IT can also be applied for robot development. Automatic deployment can be scheduled at a convenient time according to the robots' status, such as during charging. Many network applications, including NTP, are offered with the product. Automate your network robot management. Take NTP as an example. 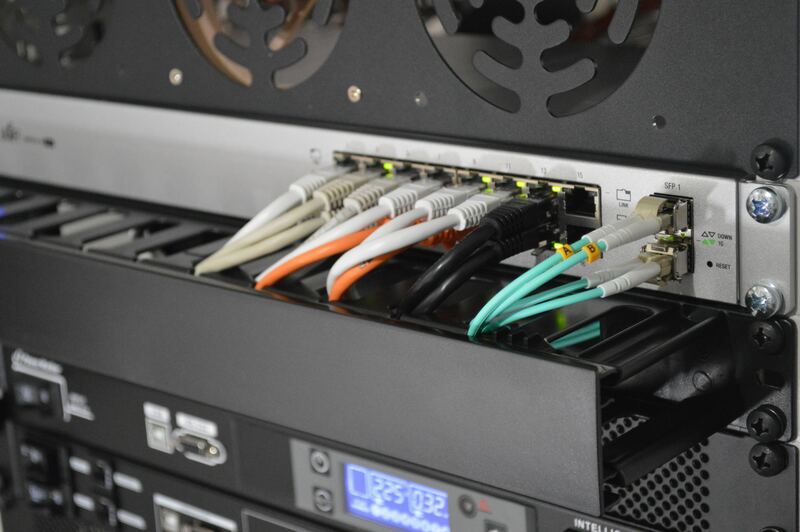 Many company networks limit connections to public NTP servers, but RDBOX makes clock synchronization between all computers easy. Other standard network services such as DNS, DHCP, and NFS are also provided. It enables communication by host name and contributes to high extensibility in coordination with Kubernetes. In addition, we provide transparent proxies for certified proxy environments that significantly reduce the productivity of Linux developers. There is no need to be aware of the presence of proxies under Wi-Fi or wired LAN networks provided by RaspberryPi3 with RDBOX edge node installed. Copyright © RDBOX Project. 2019. All Rights Reserved.